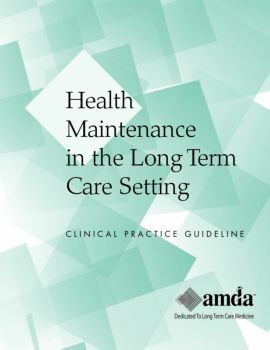 Health maintenance in post-acute and long-term care (PALTC) settings incorporates systemic, proactive approaches that promote patients’ physical, emotional, psychological, cognitive, and functional integrity. Early detection and prevention of illness may reduce morbidity and mortality in the elderly. Standard published guidelines for preventive care may be insufficient when applied to populations such as the frail, institutionalized elderly. Implementation of individualized preventive care measures may represent an opportunity to improve longevity or quality of life for frail elders. This CPG focuses on primary prevention, to the extent that it is feasible and beneficial in the frail elderly PALTC population. Improved quality outcomes and reporting to government and other agencies.